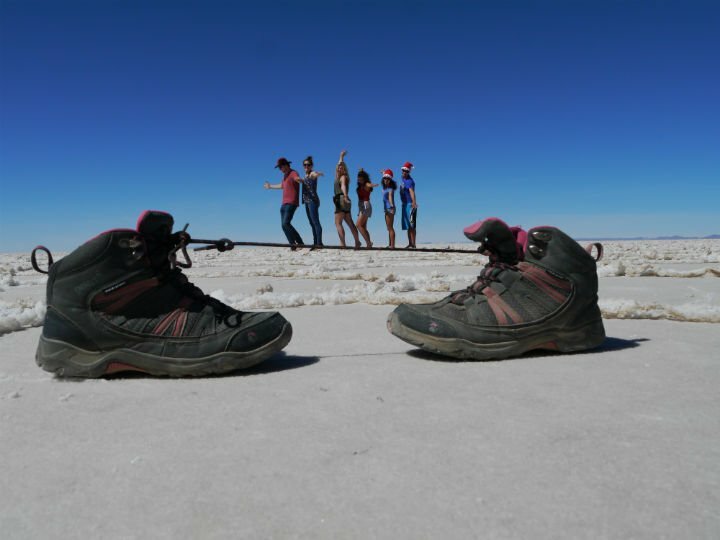 The Uyuni Salt Desert in Bolivia, our trip, organizing a tour, price, sites, itinerary, food, photos and some tips.Salar de Uyuni is the worlds largest salt flats (wiki). These salt flats were our highlight of Bolivia and one of the highlights of South America, an unreal place and a photographer’s dream. 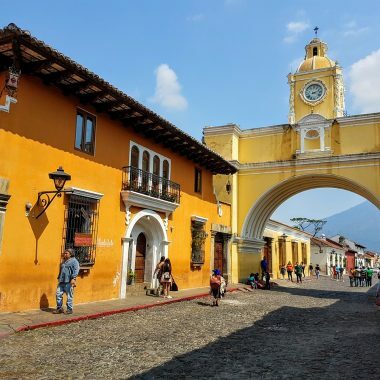 If you have read a couple of entries in this blog you will probably know that we are not big fans of organised tours and always try to see all sights on our own and as cheap as possible. 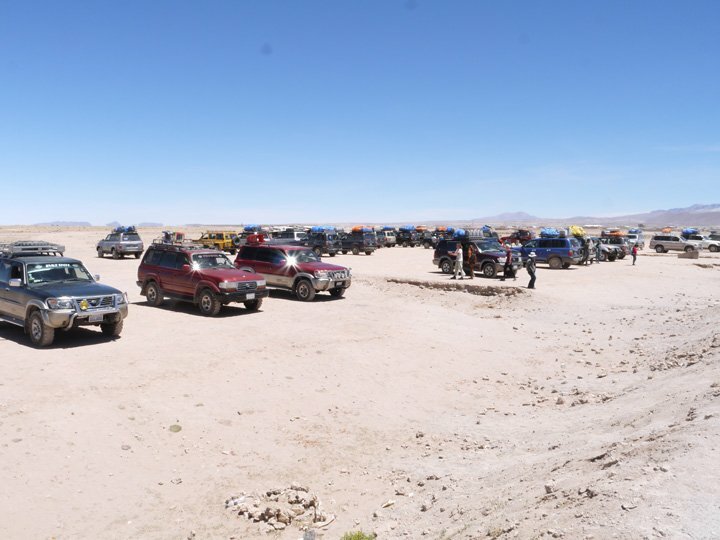 The only way to do the trip through the salt flats independent is by bicycle, motorbike or by renting a Jeep, these were not really options for us. In this entry I will tell you what we did, saw and paid. Since it was a tour there is not really that many ways to save money and thus not many tips other than pick a cheap tour and don’t buy too many snacks! 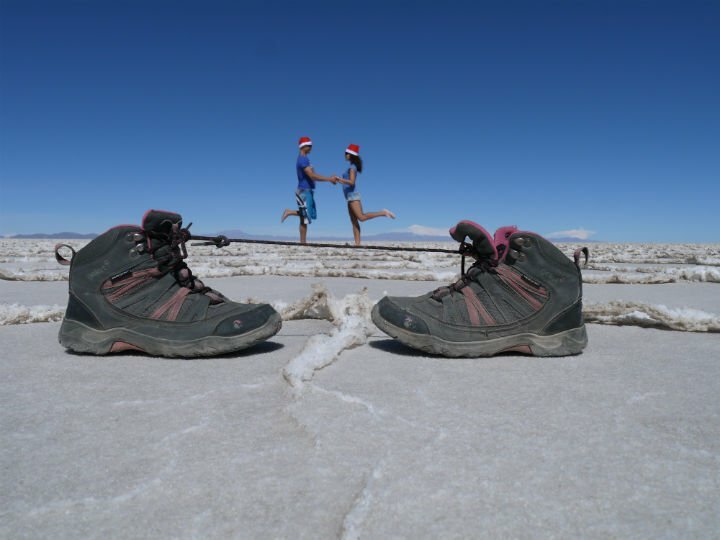 Enjoy the photos in our Salar de Uyuni Travel Guide! 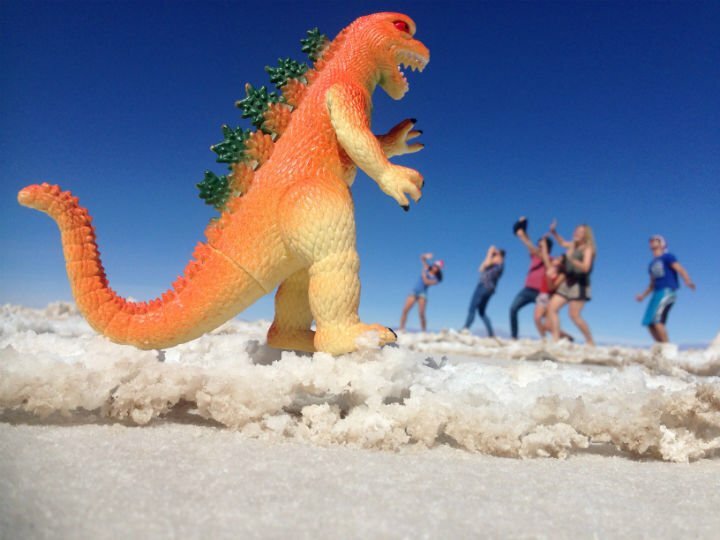 Bring photo props for taking pictures in the salt desert, google for ideas. 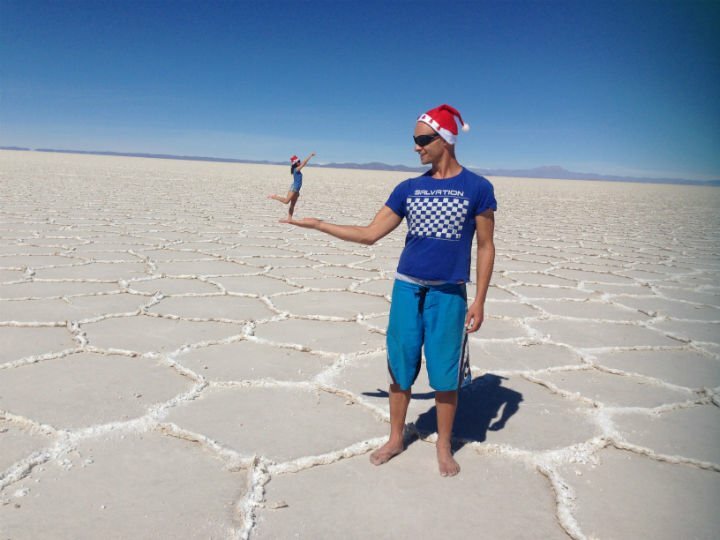 Take a video in the salt desert, check our cool video we made with a cereal box at the bottom of this post. It gets cold at night, bring enough warm clothing. Make sure you have enough cash for entrance into the parks. 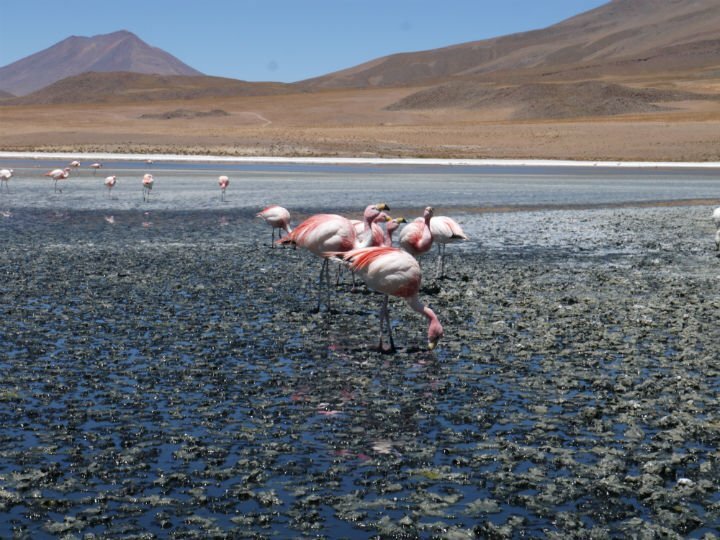 Organise to enter Chile directly from the Uyuni trip. Charge all devices, the hostel ask a fee for charging. 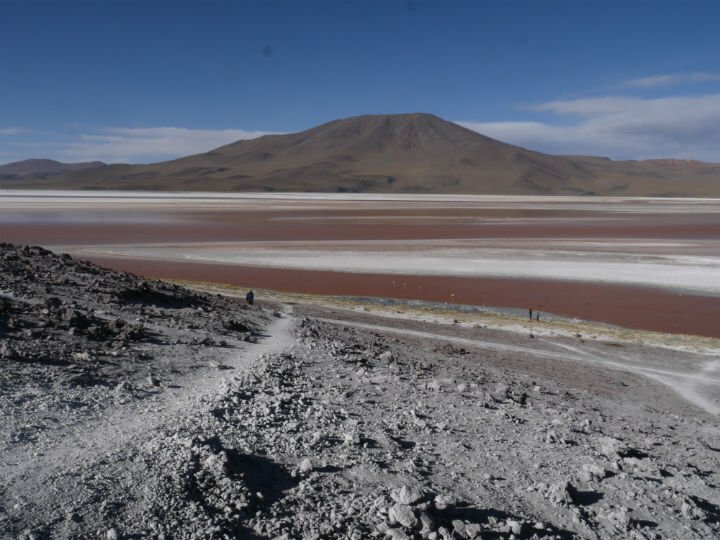 There are different trips available 1 to 4 days in length if you only want to go to the Salt Flats then the one day trip is sufficient. 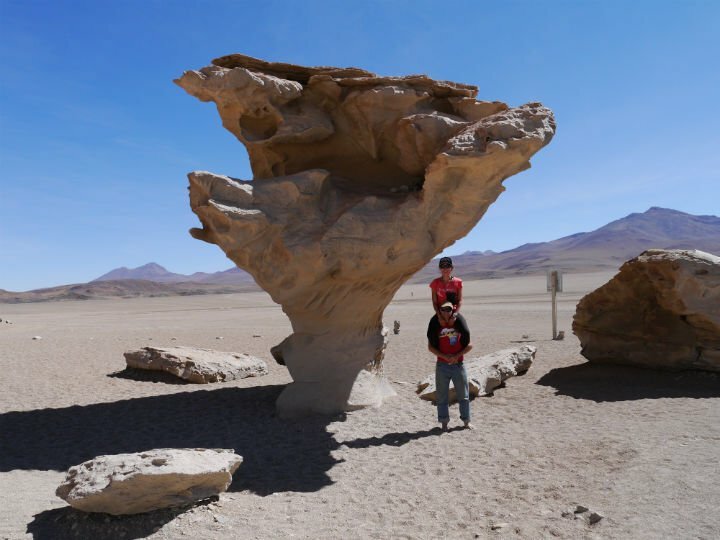 Most tours give you the option to return to Uyuni, Bolivia or head straight to San Pedro Atacama, Chile, if you choose a tour ending in Chile check if the bus to San Pedro is included. 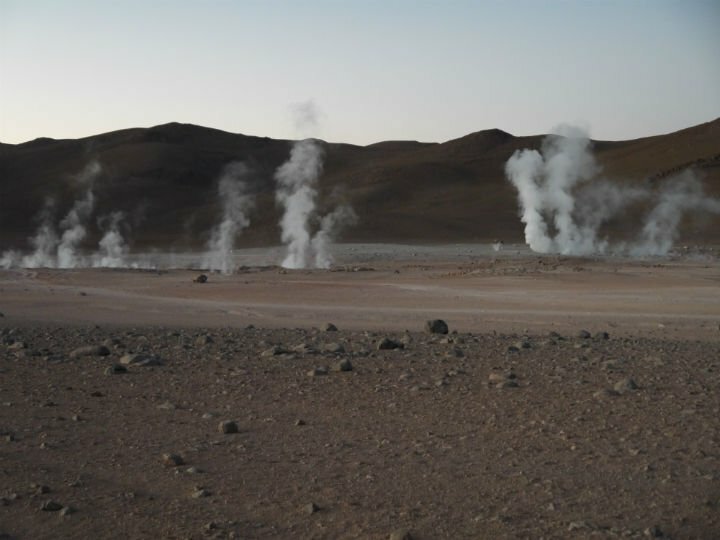 We arrived to Uyuni by night bus from Sucre at about 4am, it was freezing. Walking into town and a lady from a coffee shop found us on the street and took us to her coffee shop, many places are serving breakfast for tourists arriving by night bus this early. We had wifi, coffee and breakfast and started walking around searching for the best deal at 7am, several people came into the coffee shop from 5am onwards, selling tours. Alya at the train grave yard, one of the first stops on the trip. Booking a tour was easy, paying for it was a bit more difficult, I can really recommend that you bring enough cash. Most of the smaller operators do not except credit cards and those that do add a huge surcharge. There were many ATM’s in town, but none were working this morning and 30 minutes before we had to depart there was still a whole town full of annoyed and stressed out tourists running from ATM to ATM, luckily the problem was sorted out in time. Bringing the total cost to b$856/$124/R2040 per person. Remember to ask about the b$206/$30 entrance fees, none of the tours included this when we shopped around and it is not optional since you stay in the park one night. You need to take this cash with you; they cannot just leave you in the desert if you do not have money with you. Prices vary according to season, with peak season being from November to early April. I really liked everybody in our group and we had a cool driver/guide that made three long days in a Jeep a lot of fun. 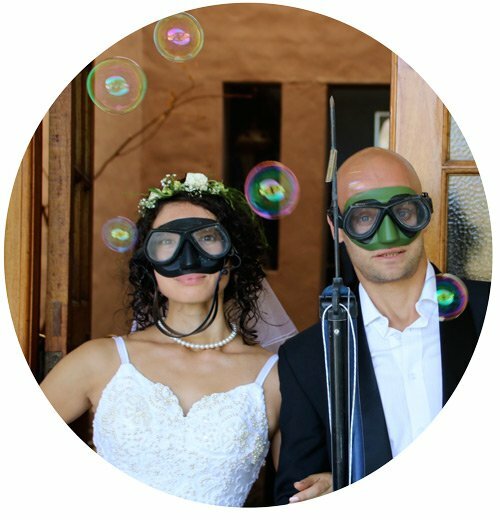 We had me (Campbell) and Alya semi-permanent international hobos, Mel and Amy British students taking a gap year and Bob and Ester a Dutch couple both school teachers on a sabbatical ‘around the world’ trip. We stayed at the hostal made of salt for the night, dinner was excellent; it was pretty cold during the night. You could take a hot shower for b$10/$1.45/ R23, so I just stayed dirty for the duration of the tour. Red Lagoon with some flamingos wandering around. We stayed in a 7-bed dorm room in the desert, dinner was nice but not enough, I was still hungry, we got a bottle of wine with dinner that was nice. The price of a hot shower went up to $b20/$2.90/R47.65. 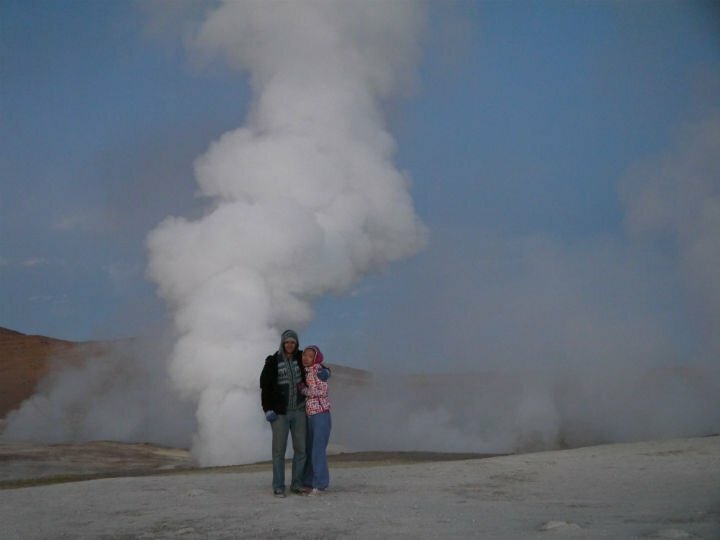 Wake up at 4:30 am, have breakfast and leave at 5am, small desert of Chiguana on the south side of Salar de Uyuni, the “Sol de Mañana” geysers, lookout to view steamy volcanoes, Dali desert, 30 minutes in the Aguas Thermales (Hot spring), Laguna Verde (the green lake) then off to the Bolivian border to go to San Pedro Atacama, Chile (you will be there by 1PM). We only got coffee, cookies and crackers for breakfast, since we had a small dinner the previous night I was starving by the end of the tour. We really had a great time, amazing scenery, fun tour, great photo opportunities, and awesome way to cross over into Chile. We are not tour fans, but if you do not have your own transport this is definitely a tour worth doing. 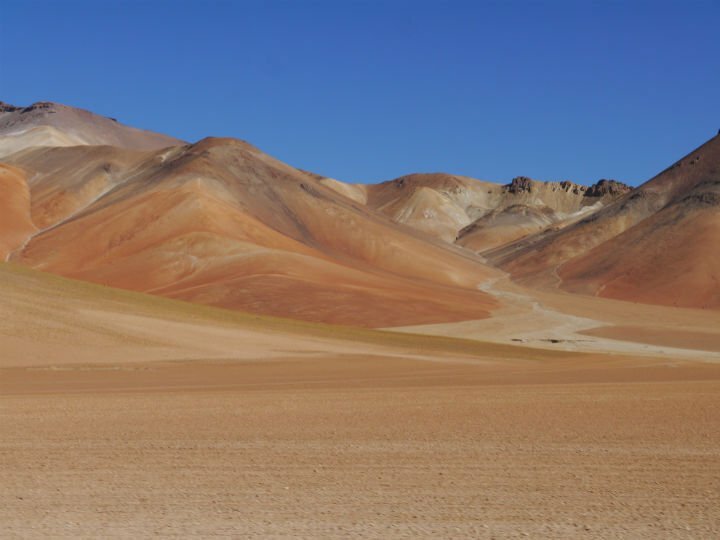 Amazing multi coloured mountains surounding the salt flats. “Standing” on Alya’s shoe laces! 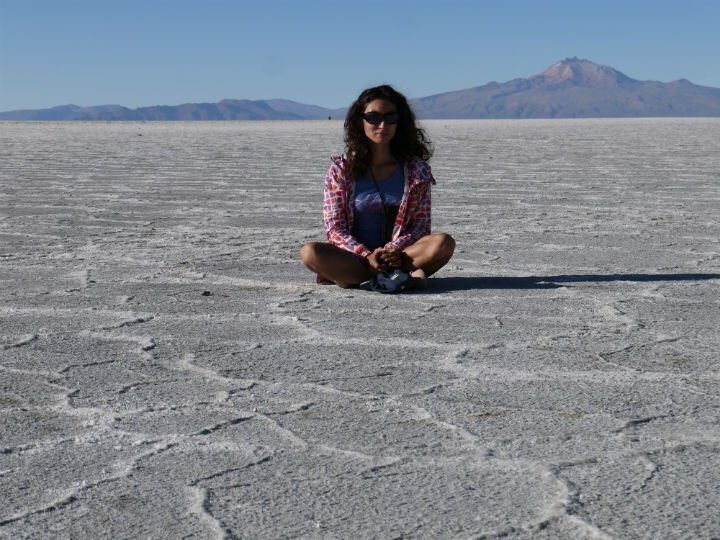 Alya sitting on the salt, Salar de Uyuni. 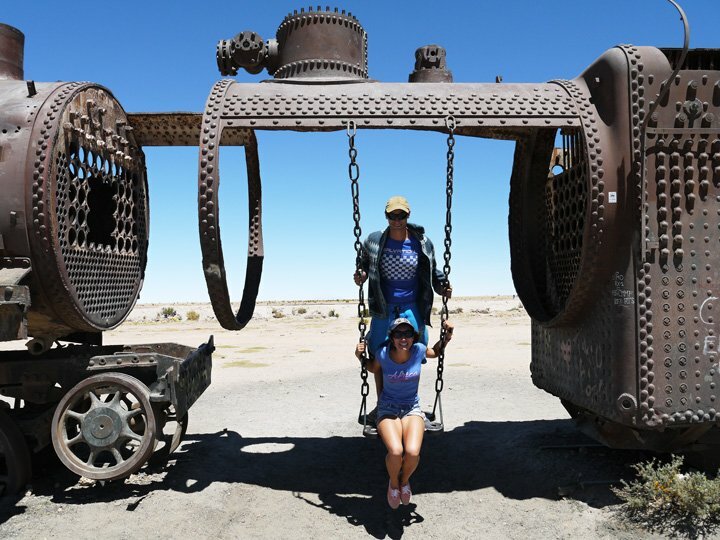 Campbell and Alya, the train grave yard of Salar de Uyuni. 🙂 Had some problems with people stealing our pics, but you are right. Working on a new smaller watermark. In the meantime I decreased the font size a bit to improve your viewing pleasure! Thanks for commenting. Hey do you guys remember what the tour company you went with was called? Did they speak English? Hello, Janette! Thank you for reading! Unfortunately we lost the agency name and contact details but it’s easy to find, it is located right on the opposite side of the road from Nonis coffee shop/restaurant. Nonis coffee shop is easy to find especially if you arrive by bus very early morning somebody from Nonis will meet you at the bus stop. 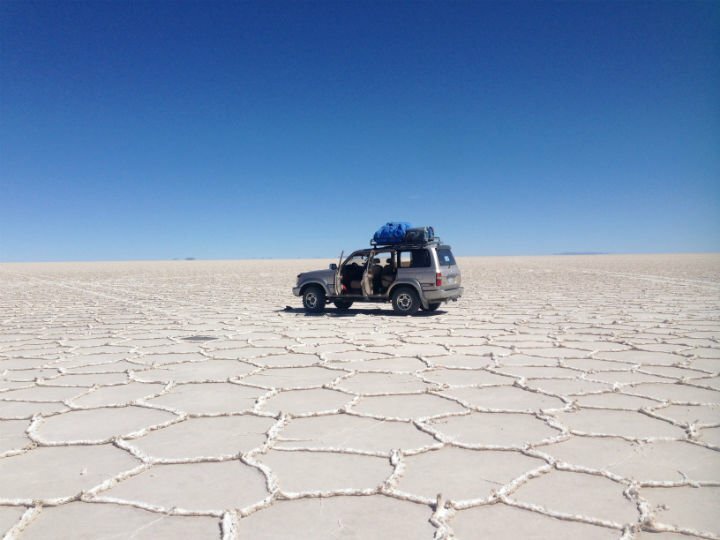 Good luck and enjoy Uyuni!